One of the things I’ve found jaunting through adventure games that’s … not exactly “disappointing”, but I can’t think of a better word … is that unlike CRPG history, there doesn’t seem to be that many early unique experiments. CRPGs sprang from pencil-and-paper where the computer equivalent was unclear, but most everyone in early adventure games seemed determined to copy Woods and Crowther. There is one exception, and the game is so obscure it is quite possible I’m the first one who has played it since the 1980s. 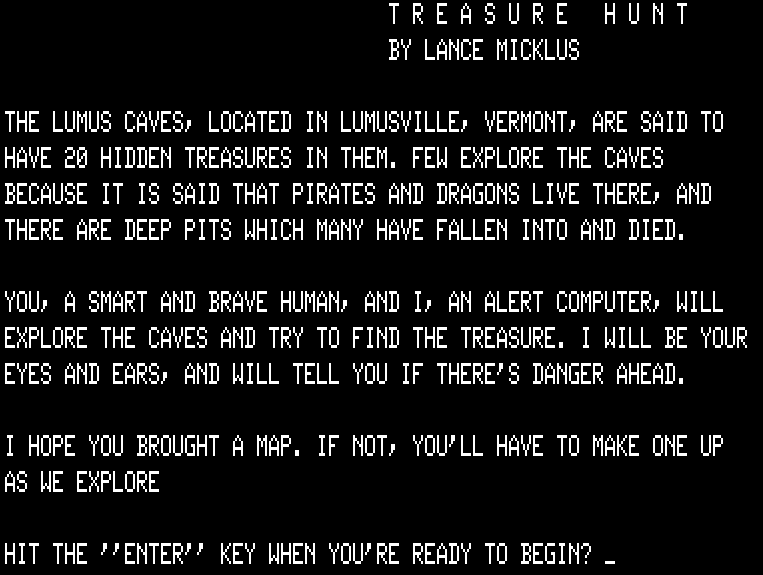 Lance Micklus later on went to publish Dog Star Adventure in 1979, which appears to be the first published type-in text adventure. Treasure Hunt I’d call marginally an adventure, but in a form generally unrecognizable because rather than branching off Adventure, it has roots in Hunt the Wumpus. Hunt the Wumpus is a 1972 offering by Gregory Yob. Jimmy Maher has a two-part series on the full history here and here. 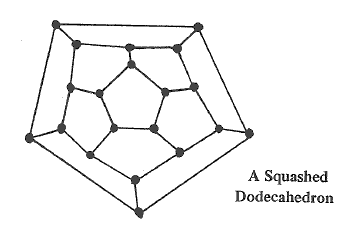 I’m playing on the classic “squashed dodecahedron” from the original game. It helps to have pre-mapped what room numbers correspond to what places on the map, although the dodecahedron structure makes it possible to “feel out” the geography off the cuff. The “draft” indicates a room nearby has a bottomless pit. Since I came from room 6, the draft has to be either rooms 14 or 16. A careful strategy would be to note that as a sort of logic puzzle condition, go back to 6, and save the knowledge for later. For instance, if a later room has no draft but room 14 adjacent, that means room 14 is safe. Risky! But now I know the pit has to be in 16. Hee hee hee – the wumpus’ll get you the next time! There’s more to the game — the wumpus can wake up, you can fire the arrow through multiple rooms, and there are “bats” that can carry you around — but this is enough of an introduction because things are about to get much more complicated. Imagine Wumpus having treasures you have to find. If you bought the game it came with a map, but I had to resort to making my own. 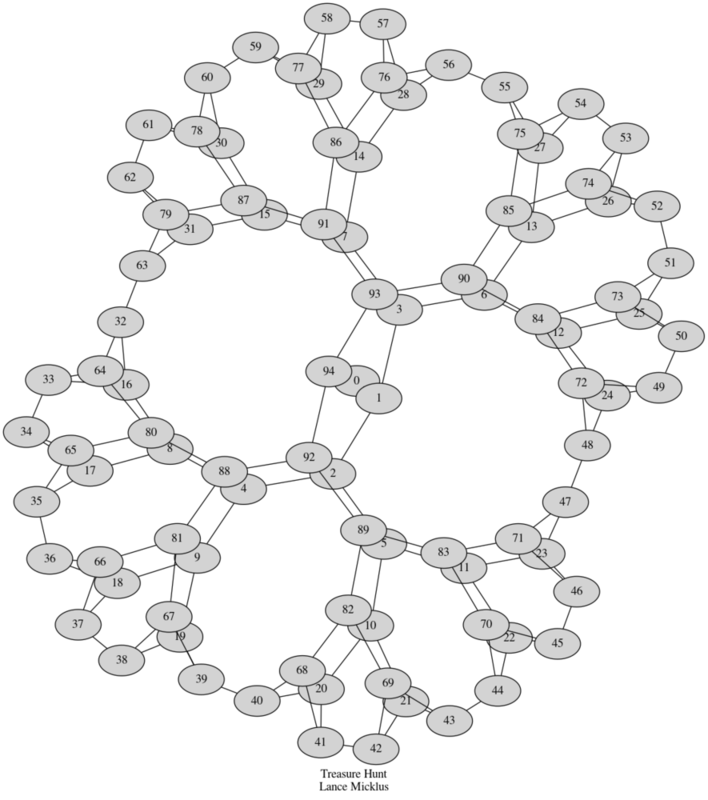 I have no idea if it is something sensible like “a dodecahedron only larger” or “a moebius strip with an extra twist” so my version is a bit of a mess. The full map I made — click to enlarge. This definitely reflects one of the downfalls of non-compass mapping — it’s hard to get relative positioning right on a complicated map. 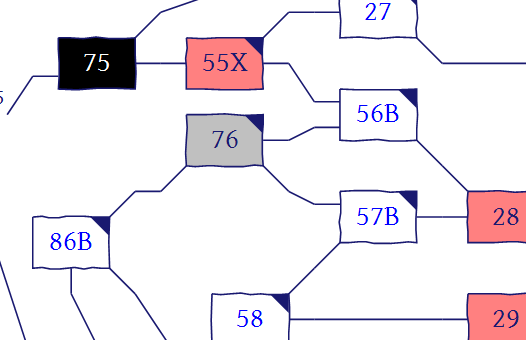 Should this particular branch go right or left on the map? I didn’t know until I got farther and had to erase and redraw. THIS CAVE HAS GOLD COINS IN IT. O.K. YOU’VE GOT GOLD COINS. I should emphasize that even though the map is fixed, everything inside the rooms is randomly placed. In a different game the gold coins might be in room 63. THIS CAVE HAS A MAGIC WAND IN IT. O.K. YOU’VE GOT A MAGIC WAND. WHAT CAVE DO YOU WANT TO EXPLORE NEXT? a.) There’s at most one object to a room. When entering a room with a portable object, you can either take it with you or leave it be. c.) …some treasures double as puzzle solutions. For example, the gold coins can be used on a vending machine to get new lantern batteries (yes, Lance must have been familiar with Adventure) but since this is done automatically upon entering the appropriate room, it is better to note the gold coins on the map and get them when the lantern starts to run low. Just like Wumpus, there are obstacles that will kill you if you wander in the wrong room. THERE IS A PIT NEARBY. wATCH YOUR STEP. SORRY, BUT I TRIED TO WARN YOU. YOU FELL INTO A DEEP PIT AND KILLED YOURSELF !!! There are also potential cave collapses, a pirate that can steal your treasure, and a dragon. There’s a room that has a barking noise. There’s also an invisible man looking for his dog, and he needs you to type the room number his dog is in and he’ll give you a $1000 bill. However, if you type the room the barking was heard in, you will fail. It turns out — using Wumpus logic — the barking means the dog is in an _adjacent_ room. So to solve the puzzle you need to find three rooms the barking is coming from and triangulate. In any case, I’m not quite up to a successful run with 20 treasures, so I’ll save what will hopefully be a winning post (and the true secret to slaying a dragon) for next time. Wumpus does double-duty as an Adventure forerunner so it’s not that these threads are totally unrelated — just that this particular branch of the tree died off quite early on. The fellow at Gaming After 40 encounters a number of primitive adventure game mutations, like primitive early hyperfiction, and Jimmy Maher’s writeup on His Majesty’s Ship Impetuous presents another curious what-if, a system that attempts, Eliza-like, to glean what the player wants to happen through looking for keywords. The looking for keywords thing I don’t consider too bizarre — I remember at least one mainstream commercial game went with that parser, and T-Zero (one of my all time favorites) does that, although it’s well done enough you wouldn’t know. In fact, I think there’s still room for hybridizing in some keyword-matching into what now gets used as the “standard parser”. Wacky hypertexting I’m looking forward to. I vaguely recall some TRS-80 game I booted up once that looked like that but I never played it. Oh! The Prisoner is equally wacky, but I’ve only read zarf’s description. I think Maher did a writeup of that one too. In any case, it’s still not like RPGs where nearly every game from 1975 to about 1981 feels very different before people started copying Ultima, Wizardry, or Rogue. 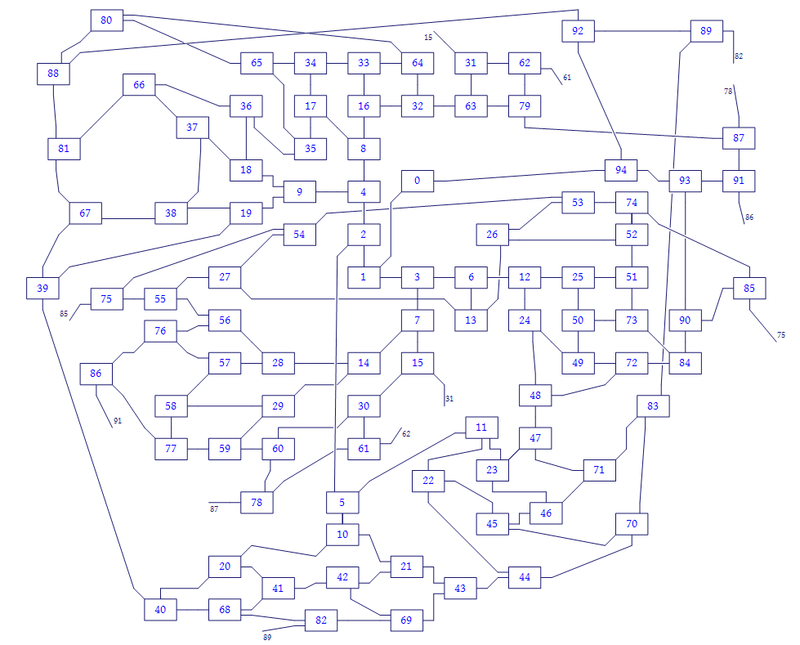 I found your page and liked the game so much, I found the BAS file and ported it to C. With Mr. Miklus’ permission of course, I like to post the code publicly and include your map(with proper credit to you of course), if that’s OK with you. Please let me know. Lance, was happy to have his game ported. The new code, the original source, your map (with credits added), and spoilers are in github at http://github.com/evancwright/TreasureHunt. To play the game, just clone the repository and run ‘make’. I had the pleasure of meeting Mr. Micklus in 2017 at Tandy Assembly. I posted a picture at http://retroteacher.net/th. Thanks again for your great blog. It’s really fun to read about these old games. Very nice! I’ve been trying to get at something like this for a while — I think it’s important enough I’ll make a post tomorrow about it.